Executive Tourbillon Free Wheel – Sometimes, just sometimes, you are confronted with a piece of art that you simply cant describe. There is no point to start, neither is there one to end with. How on earth is mankind able to design something so impressive like this in sketch (view) and than -even more impressive- built it?! This watch leaves me speechless! Ulysse Nardin, never shy of shocking the world, has done it again. With the Executive Tourbillon Free Wheel they created yet another bespoke fine piece of extreme Haute Horlogerie. The ones that follow Ulysse Nardin know they are always able to surprise and set new standards but this time they out-performed themselves. Where other manufacturers mostly keep the interesting part of the heart of their watches on the backside of the watch Ulysse did it the other way. 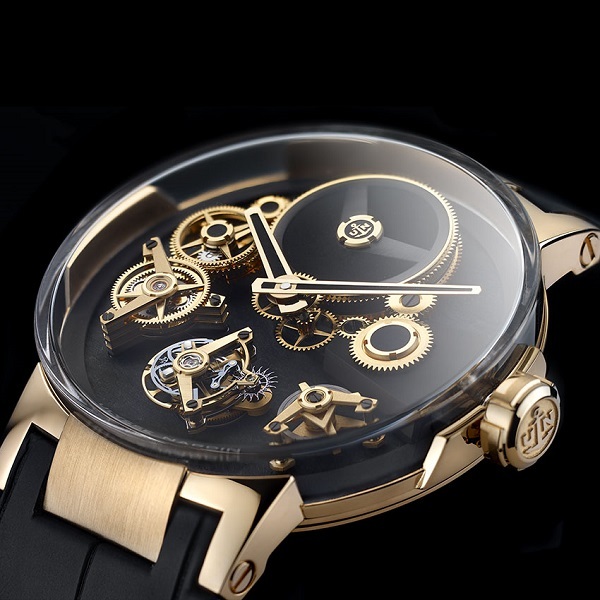 The entire movement is built and displayed… on the front. Ridiculously detailed it the heart of the new in-house developed UN-176 movement. The running Tourbillon literally drags you into its complex technique of tiny wonders that, combined with the other gears, are able to show you… time! 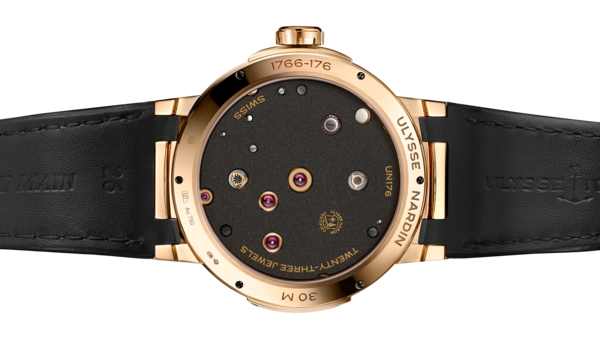 As you can see clearly Ulysse Nardin uses their own innovative material silicium. This extremely low-friction material prevents the escape wheel, balance wheel and lever of wearing out and increases the service interval period of this wonder. Basically the silicium parts don’t need lubrication and are as hard as diamonds. It is a result of using a synthetic nanocrystalline diamond film. Ulysse situated the power reserve indicator at the four o’clock position. The kind of boomerang style indicator (hè, don’t look at me, that is the way Ulysse names it on their website) clearly shows the amount of power that still is available. Seven days is a serious power reserve capacity for such an incredible complex movement. As you can see the “boomerang” is fixed. By winding the watch and giving it energy the bar indicators will move counterclockwise and when the boomerang points at the end of the three “bars” the full capacity of energy is stored. As mentioned the astonishing part of the Ulysse Nardin Executive Tourbillon Free Wheel is the fact that the whole movement is basically a kind of “reverse engineering”. That a Tourbillon gets all the attention on the front of a watch is common practice amongst creators of fine horologic pieces. Why else would they put so much efforts in creating a wonder if one does not see it. A power indicator is nothing “out of the ordinary” either. Okay some manufacturers put it on the back but I never understood why. Wouldn’t it be more convenient when one sees “the power left” on the front of the watch? Anyway.. But what about the gear train?! This is very uncommon for non-skeleton pieces to be visible on the front of dials. Well not for Ulysse Nardin, what about the Freak?! In case of the Executive Tourbillon Free Wheel however they did a marvelous job. It is really incredible how it looks like the gear train “hoovers” above the dial. If all is on the front, what’s visible on the back of the Executive Tourbillon Free Wheel?! As this superb piece of Haute Horlogerie is built in an almost completely glass case one can imagine the back has a transparant sapphire cover too, and it does. But.. since nearly the entire movement is placed on the front side of the stone slab, dividing front and back, there is not much to see in the backside of the Executive Tourbillon Free Wheel. Not much more than a few rubies set in golden chatons and three of the axis used in the movement are visible on the case-back.